Oh man. If you are unfamiliar with the Docherty duo, get yourself acquainted now! They have to be one of the most adorable and extremely talented (and amazing) team ever. Ever! I have been completely enchanted with everything they produce since I stumbled across The Snatchabook on Netgalley a few years ago. When I saw they had a new book coming out, I got excited. 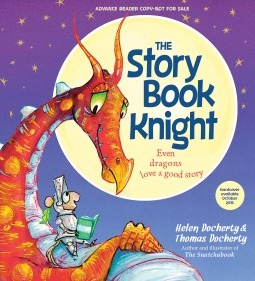 I was a bit worried it would not live up to my expectations since I absolutely LOVED The Snatchabook, but The Storybook Knight did not disappoint. I loved that my 8 year-old son climbed up into my lap to read this one with me. (He knows how excited I was to read this.) As usual, the illustrations were AMAZING. Absolutely stunning and the perfect compliment to a charming story. I am always in awe of the talent these two have. I had a digital copy to review, and yet, the images were still vibrant and eye catching. We loved looking at all the little details included on the pages. Little Leo is a reader, and I love him for that. It was great to see how he tackled a problem in his own unique way. I'm all for a character (person) staying true to themselves despite the challenges they face. What a great message for little minds! I highly recommend this one. In fact, I think you'll want to add it to your personal collection. I know I do!